“Don’t juice without it!” – One of over 150 *FIVE STAR* Amazon Reviews! How will your body will react to green juicing with a sensitive stomach? How can you stay motivated after the initial excitement wears off? What are the best juicers available, and which one is best for you? A passionate green juicer for over five years, Brock gives you her best tips on how to manage each as you move forward in this journey. She shares her knowledge, discoveries, and lessons learned from her years of green juicing! She gives you the good, the bad, and the ugly so you can make smart and informed decisions as you learn how to heal your body and return it to harmony using healthy plants from your farmer’s market, garden, or produce aisle. 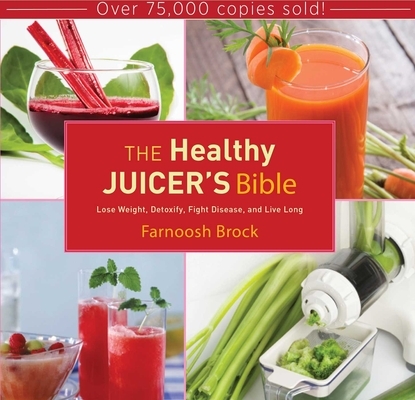 In this widely praised juicing recipe book and guide, every fruit and vegetable you can think of pairs up in this juice bible for devoted followers of the juice craze that’s sweeping the nation. From radical-fighting blueberries to nutrient-rich kale, to protein-packed spinach, The Healthy Juicer’s Bible includes nutritional information and details on the benefits of juicing for life! Whatever your fitness regimen, health goals, or daily routine, The Healthy Juicer’s Bible is the ultimate, comprehensive resource for every aspect of the wonderful world of juicing!